Individual Therapy for Adults - Phyllis Bisch, M.A., L.P.C.Phyllis Bisch, M.A., L.P.C. 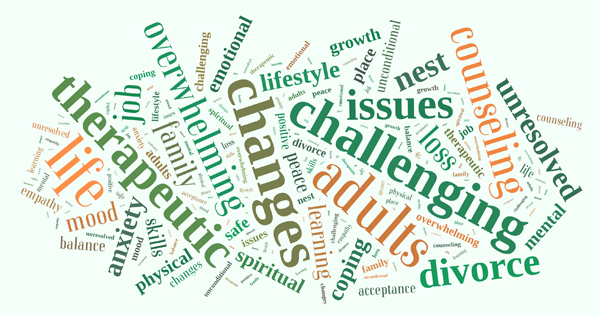 Life change issues such as divorce, job loss, loss of a loved one, location change, or empty nest syndrome. Family of origin therapy addressing unresolved issues that appear to be driving ones adult life. Dealing with mood and anxiety disorders; learning lifestyle changes and coping skills that can help. How to live peacefully and joyfully in difficult situations. Spiritual, emotional, mental, and physical balance and growth. A safe place to be heard and express feelings in an environment of acceptance, unconditional positive regard, and empathy. Please contact me if you or someone you know struggles with these or similar life issues.